Our Amish porch swing can also be used in the garden hung from a tree or using a swing stand. 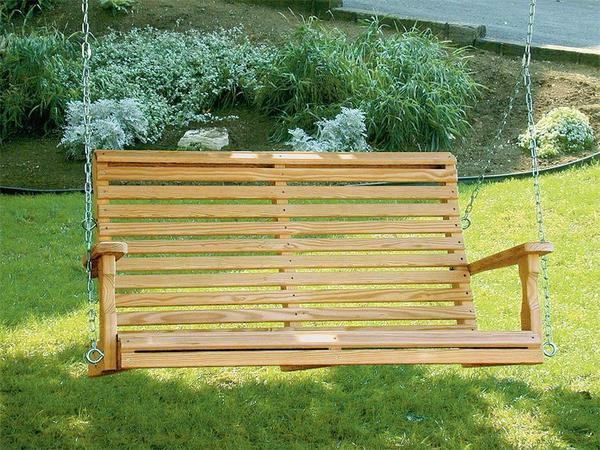 Since this swing is handcrafted from pressure treated pine wood it is resistant to insect and weather elements. You can order our water sealer stain or you can choose to finish the bench yourself with stain or paint. A comfortable fit for your body and budget, our Amish Roll Back Swing will offer you years of relaxing summer afternoon - proudly Amish-handcrafted in America! The swing comes with a zinc plated chain that fits an 8’ or 9’ ceiling.